Texas Rangers third baseman Adrian Beltre at Globe Life Park in Arlington in August 2014. Texas Rangers third baseman Adrian Beltre at Globe Life Park in Arlington in August 2014..
A long drive, deep over the outfield wall … without a boost from performance-enhancing drugs. In our view, and according to advanced stats, Beltre should be a Hall of Famer someday. But we worry that he won’t be because his conventional stats lack that Cooperstown shine. For instance, in terms of per-plate appearance rates, Beltre ranks in the 80th percentile of his peers2 in isolated power, the 70th percentile in contact rate, the 50th percentile in speed and the 82nd percentile as an overall hitter. (His only real offensive weakness is a 27th-percentile walk rate.) And those are just the rate statistics; Beltre’s durability has also seen him notch the second-most at-bats of any active player and the 53rd-most of any player ever. That longevity is a big reason why Beltre ranks ninth all-time in offensive wins above replacement (oWAR) among third basemen. Only one non-Hall of Famer, the easily forgettable Toby Harrah, ranks higher, and Beltre should pass him (plus Home Run Baker) this season, assuming that Beltre’s 2015 oWAR resembles his yearly output over the past five seasons. In fact, based on projections from Baseball Prospectus, there’s a good chance that the only players ahead of Beltre in oWAR by the end of his career will be offensive juggernauts Wade Boggs, George Brett, Chipper Jones, Eddie Mathews and Mike Schmidt. And defensively, Beltre’s advanced numbers are among the best ever. Per defensive WAR (dWAR) and defensive runs saved above average (DRAA),3 Beltre is the second-best defensive third baseman in baseball history. Only Brooks Robinson, whom Reds manager Sparky Anderson had nightmares about after Robinson’s unforgettable defensive performance in the 1970 World Series, ranks better. According to dWAR, only 19 other players (across all positions) in baseball history were more valuable defensively than Beltre has been. The defender most like Beltre at this point is Mazeroski, who made it to the Hall almost entirely on his defense. Beltre, by contrast, combines Mazeroski-like defense with vastly superior offensive stats and greater durability. Yet, we worry about Beltre’s fate because his traditional measurements lag behind his advanced ones. The case against Beltre starts by saying that his nearly 400 home runs may be somewhat devalued by the steroid era — more than half of the club’s 51 members hit the majority of their home runs in the 1990s or 2000s — even if Beltre has never been implicated for steroid use. And Beltre’s other impressive credentials (four Gold Gloves, four Silver Sluggers and four All-Star Game nods) are good, but not great. Eric Chavez, for example, will only see Cooperstown as a visitor, but he won six Gold Gloves at third base. In addition, Beltre is unlikely to hit above .290 for his career or win a most valuable player award, and he has never won a World Series (only playing in a single Fall Classic). Simply put, Beltre’s conventional résumé falls short of Cooperstown’s traditional benchmarks. While there is no generally accepted baseball equivalent of Basketball-Reference.com’s Hall of Fame probability metric, Bill James developed a few good ways to gauge a player’s traditional statistical portfolio: the Hall of Fame Standards and Monitor tests, as well as the Black Ink and Gray Ink tests. Together, those metrics measure how well a player met certain (admittedly arbitrary) benchmarks that, historically speaking, are strongly correlated with Hall of Fame induction. In the “Ink” tests — which measure how often a player led the league and finished among the top 10 in important statistical categories — Beltre sits well behind the typical Hall member. He does fare somewhat better in the other, benchmark-based calculations (though he still ranks below average in both the Standards and Monitor tests), and at just 36 years old, Beltre still has time to add to his totals. But overall, he may not even have a coin flip’s chance at the Hall of Fame, according to traditional gauges. A logistic regression between the James metrics and Hall of Fame enshrinement for the eligible players on Baseball-Reference.com’s leaderboards4 would assign Beltre a mere 18 percent chance of induction if he retired today. But our hope is that Hall of Fame voters are slowly moving past the older considerations. If they look instead at Beltre’s advanced numbers, they’ll see a Hall of Fame worthy outlier. Look at the Jaffe WAR Score system, or JAWS.5 Built on the foundation of WAR, JAWS attempts to strike a balance between players who compiled value over a long period of time (think Paul Molitor, whose JAWS was 57.5) and those who burned brightly for a shorter span of seasons (think Jackie Robinson, whose JAWS was 56.8). 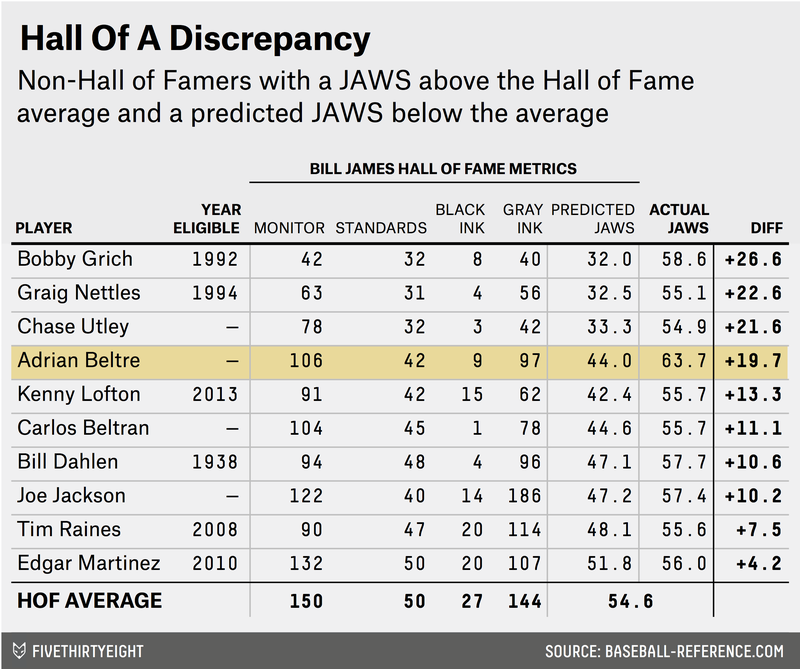 And the difference between Beltre’s actual JAWS and what we’d predict from his conventional credentials6 is stark. How can there be such a big difference? It’s partly because predicted JAWS doesn’t take into account defense (because it’s using conventional stats) and actual JAWS does. As we noted previously, defense is very hard to measure in a conventional sense. That’s especially the case at third base, where people can’t even agree on the best skill set for the position. It used to be impossible to say what exactly a player’s defensive range was, for instance. That’s why James’s metrics don’t make much of an attempt at incorporating defense, with the exception of taking into account a player’s position and where it sits on the defensive spectrum. But now we can understand how valuable Beltre is defensively. And we know that his mixture of offensive and defensive production for a third baseman is very rare. The question left is whether Hall of Fame voters will see things that way, conventions be damned. His offensive bona fides are also clear from such traditional statistics as home runs, of course. Among third basemen, Beltre, with his nearly 400 long balls, ranks fifth all-time; three of the four ahead of him are either already in Cooperstown or are locks to make it someday (Chipper Jones). Qualified hitters (according to Fangraphs’ leaderboard) who played between 1998 and 2015. Defense is harder to measure than offense, and traditional measurements have a way of propping up horrible defenders (see Jeter, Derek). But advanced statistics such as dWAR and DRAA (which is based on video-tracking data for recent seasons and estimated “zone ratings” for years before that) seem to capture defensive skill well. All modern players in the top 10 for DRAA have won at least one Gold Glove, and all but two have won at least four. With additional variables for a player’s era and whether a player was publicly linked to steroids. For those curious, the eponym behind the number is Sports Illustrated’s Jay Jaffe. As measured by a regression using the James metrics. Among either eligible players who were not elected or those ineligible for induction. Predicted JAWS is designed so that its average equals the average JAWS.